As Dmitry Medvedev prepares to leave the Kremlin, there is much to be said about his accomplishments in the foreign policy sphere. During their last meeting in Seoul on March 26, Russian President Dmitry Medvedev told U.S. President Barack Obama: “The past three years have probably been the best three years in the history of Russian-American relations during the past decade.” The words seemed sincere, and the two leaders parted as friends. Obama grew sentimental and even handed his Russian counterpart an envelope with a personal handwritten note. Outgoing American presidents, by tradition, leave such notes to their successors before leaving the White House. The messages usually contain advice. 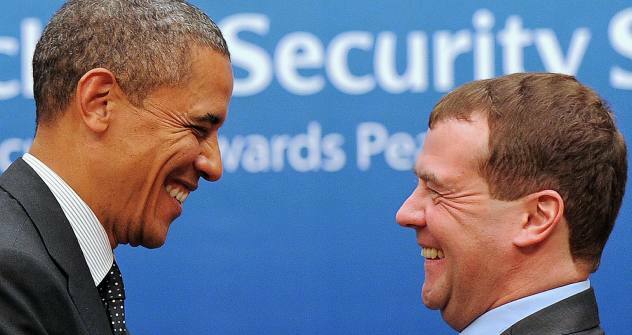 But Obama was not giving advice to Medvedev. In a small way, he thanked his friend Dmitry for the confidence that enabled them to solve many problems together. Medvedev was so moved that he could not help showing the note to several members of his delegation. And yet that idyllic scene might never have taken place. Medvedev’s four-year term in foreign policy began in such a way that no one would have been surprised if Russia’s relationship with the West would have produced something close to another Cold War. The reason was the Russian-Georgian war in August 2008. The story goes that Medvedev’s decision to launch an operation to coerce Georgia into peace and then to recognize the independence of Abkhazia and South Ossetia was almost unanimously backed by the members of the Russian government and of the Kremlin Administration. But the issue of whether, by recognizing the independence of Abkhazia and South Ossetia, Moscow would lose the rest of Georgia for a long period, if not forever, was not at the top of the agenda during those critical August days. The Kremlin and its main incumbent at the time were preoccupied with another problem – the very real chance of ending up on a list in foreign policy circles that also included such Western bogeymen as Mahmoud Ahmadinejad or Kim Jong Il. “Medvedev expected isolation. Morally he was resigned to the fact that the echoes of the Georgian war would haunt him throughout the four years of his presidency,” said a source close to the Russian president. The fears were not unfounded. There were calls at the EU for sanctions against Moscow, the most vocal of which came from Poland and the Baltic states. When German Chancellor Angela Merkel flew to Sochi to meet Medvedev on Aug. 15, 2008, she did not mince words. “Merkel at the time said in so many words that what we [Russia] had done would greatly complicate relations with the European Union. She said she would never support us on the issue,” said a participant in the talks. But Medvedev was lucky in at least two ways. First, France happened to hold the EU presidency at the time and its energetic and cynical president, Nicolas Sarkozy, did not miss the opportunity to act as a broker in settling the Russian-Georgian crisis. He quickly agreed on a peace plan that Medvedev and Georgian President Mikhail Saakashvili signed. Secondly, the Five-Day War occurred as the world was preoccupied with the global financial crisis. Because of the crisis, economic pragmatism prevailed over the political emotions that raged in Europe at the time. The crisis upstaged the Georgian story on the world agenda. As early as October 2008, Medvedev, attending a conference on world politics in Evian, France, spoke mostly about measures to stabilize the financial markets and only passingly about the August war. A month later, talks at a Russia-EU summit in Nice convinced Moscow that no one was going to ostracize Russia over the Georgian conflict. Sarkozy and Merkel played the main role in bringing about reconciliation with Europe. “The Germans did not budge from the European position on the conflict. But Berlin did more than any other country to keep up the dialogue with Russia. This was due to the fact that Germany had the biggest say in EU decisions, especially since Germany’s approach was shared by Paris,” said a Russian Foreign Ministry official. People who frequently accompanied Medvedev on his foreign trips say that the chemistry between him and Merkel is better than with any other world leader. “They have a very good, warm relationship. It has helped them to agree their positions and formulate them clearly on more than one occasion,” said a member of the Kremlin Administration. Medvedev personally selected a gift for Merkel’s birthday last year, and when traveling abroad, he has often made a point of dropping by Germany to meet with the chancellor. Antonov recalled an episode when Moscow and Washington ran into the problem of exchanging telemetric data on missiles. The United States wanted this commitment to be written into the treaty while Russia believed it should not be in the treaty. “Medvedev eventually came up with a solution that satisfied the Americans and enabled us not to cross the red lines. It was not a concession, but a diplomatic solution to a problem,” Antonov said. Antonov also gives Medvedev credit for the provision in the preamble to New START that links strategic offensive arms and defensive arms to missile defense. The improved relations with the U.S. formed during the work on New START did not end when the treaty was signed. Russia suddenly became accommodating towards Washington even on issues that had caused problems between the two countries during the administration of George W. Bush. In June 2010, Russia did not just back UN Security Council Resolution 1929, which imposed fresh sanctions on Iran, but also agreed not to supply Tehran with S-300 missiles under a contract that had already been signed. On the eve of the adoption of the Iran resolution, Russian Foreign Ministry spokesman Andrei Nesterenko said that the sanctions would not influence Moscow’s plans to ship S-300 missiles to Tehran. When he learned about this, Medvedev personally issued a denial of Nesterenko’s statement. To be sure, the official admitted in the same breath that Russia had been ‘cheated a little bit’ over Libya because the resolution was used to cover actions that it did not foresee. “On the other hand, the alternative was to continue to defend cannibals and lose everything,” said the source. The friendship between Medvedev and Obama also withstood the spy scandal in the summer of 2010 when 10 Russian sleeper agents were arrested in the U.S. Moscow, contrary to expectations, instantly admitted that they were spies; thanks to this move, the scandal quickly died down without causing any harm to the relations between the two countries and the Russians were soon back home. First published in the Kommersant-Vlast magazine.